We are a family friendly mobile espresso stand. 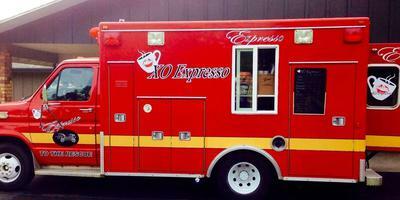 Our truck is an ambulance that was converted into a mobile espresso unit. We serve hot, iced, and blended espresso as well as smoothies, Italian sodas, and energy drinks. We also serve bagels, muffins, and cookies. Will travel in or around the area. Please contact Katie at kaytayluv@hotmail.com for more information.